And so we've come to the end of another month. May absolutely whizzed by - most likely helped along by two glorious bank holidays, and half term this last week. It's been such a lovely one though, and I'm actually a little gutted its over! I just hope the sunny weather sticks around for June as well. 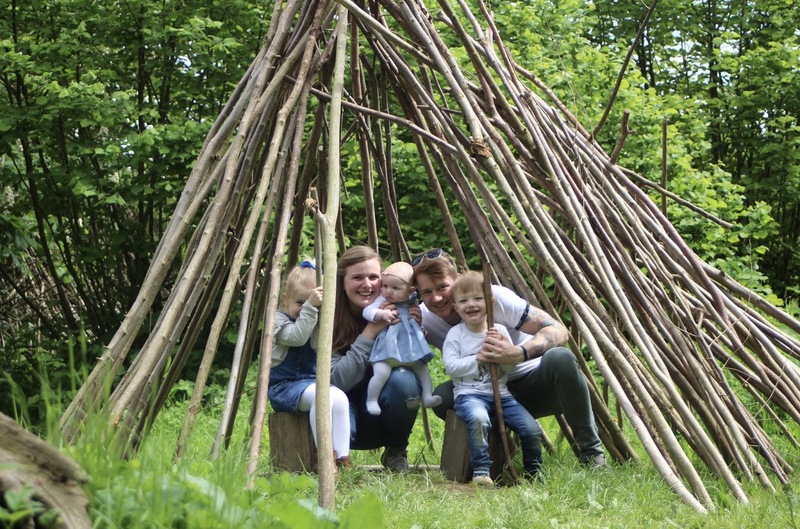 With a mini heatwave and the sun finally making an appearance, we managed to get out and about so much in May. 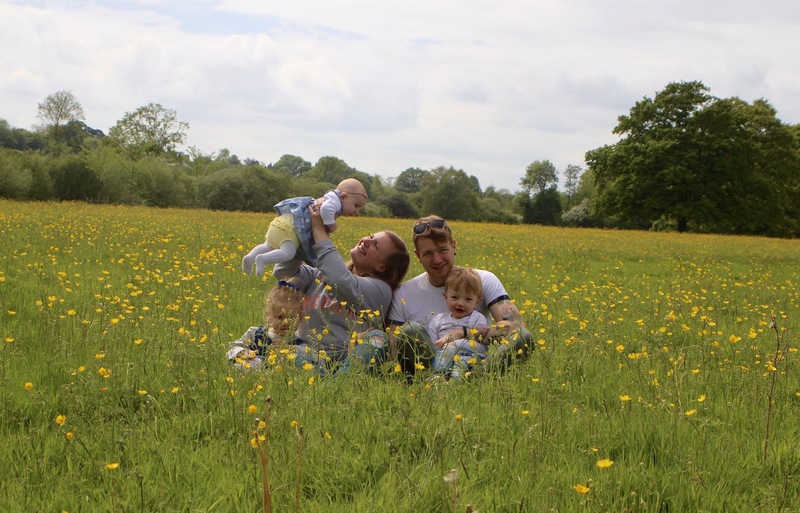 We visited a new National Trust spot - Sissinghurst Castle - where this month's Me and Mine pictures were actually taken. The littles are just so much easier to manage when out for some reason. At home they seem to bicker and squabble over everything, but it's as if they remember how to play together when we go out. Don't get me wrong, I'd much rather it was this way around... but I'd prefer if it was this way at home too! Jack and I also had a lovely date night this month, as my sister offered to babysit while we went to the cinema. I've always said there's not much I miss about life pre-kids. But I think being able to go to the cinema is one of those things. Even if you're not really talking to each other, we love it! I've not really felt the affects of my PND recently, and I think the better weather is definitely helping. Having Lilah in such a good routine now really helps too. Jack and I have our evenings together again, and that qualty time as a couple is just what we need sometimes. If anything I think our relationship is stronger than ever at the moment. 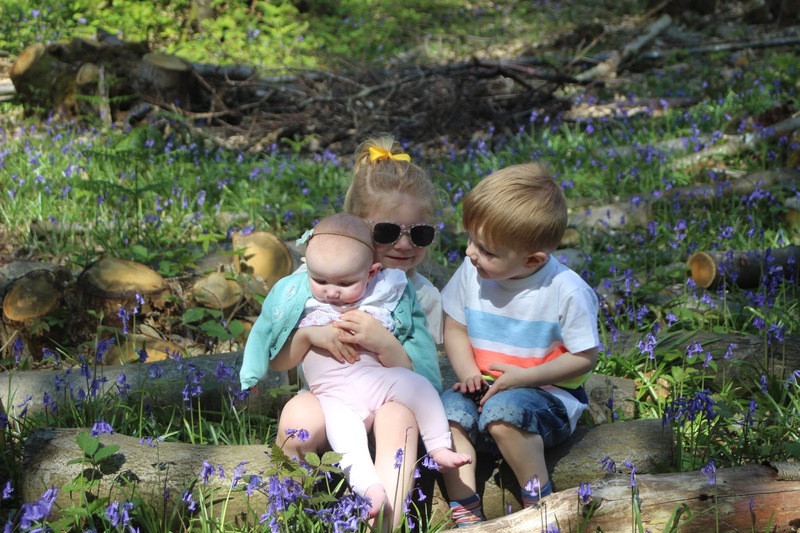 And honestly, life with three little ones is just crazily perfect right now. There’s a lot to think about when you’re planning to take a holiday during pregnancy. 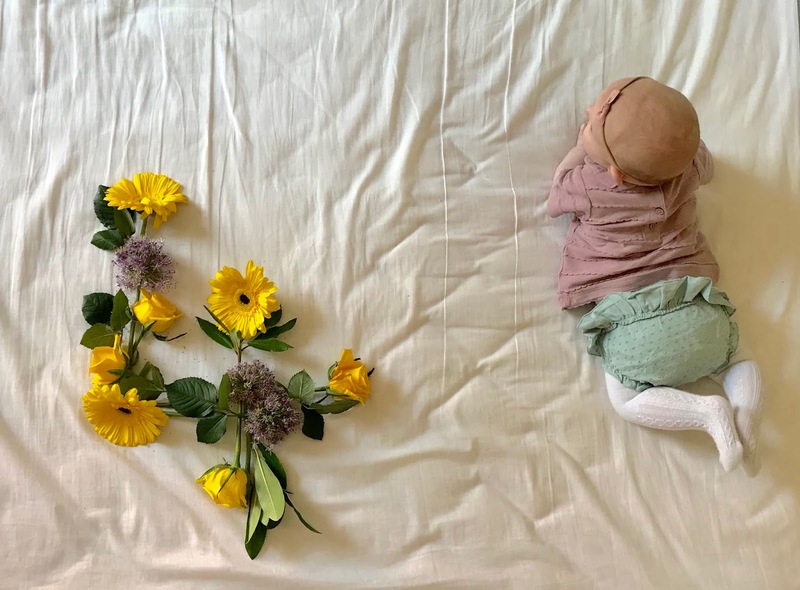 You want to make sure you’ll be relaxed and as comfortable as possible, and chances are you’re going to want a little bit of luxury thrown in there too - you are growing a human, after all! Luckily we’ve done some research to take the headache out of your decision-making process. Here are six places to travel this summer if you’re pregnant. The capital of France is known as the city of romance, which is why it’s ideal for a pregnant getaway. To enjoy the culture without the crowds (and get a bit more space for you and your bump), head to smaller, lesser-known museums like Musée de l’Orangerie and Musée Marmottan, or stroll around the picturesque parks and gardens. Jardin du Luxembourg is a favourite. If you want to sample the best authentic French cuisine, skip the tourist hotspots and enjoy the food at small, family-run bistros instead. 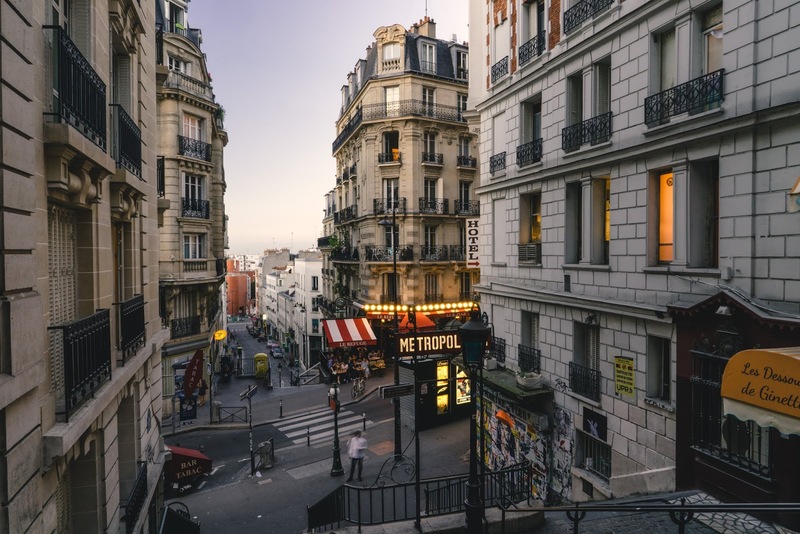 And if you're on a budget, The Guardian has created a fab list of the best free things to do in Paris. 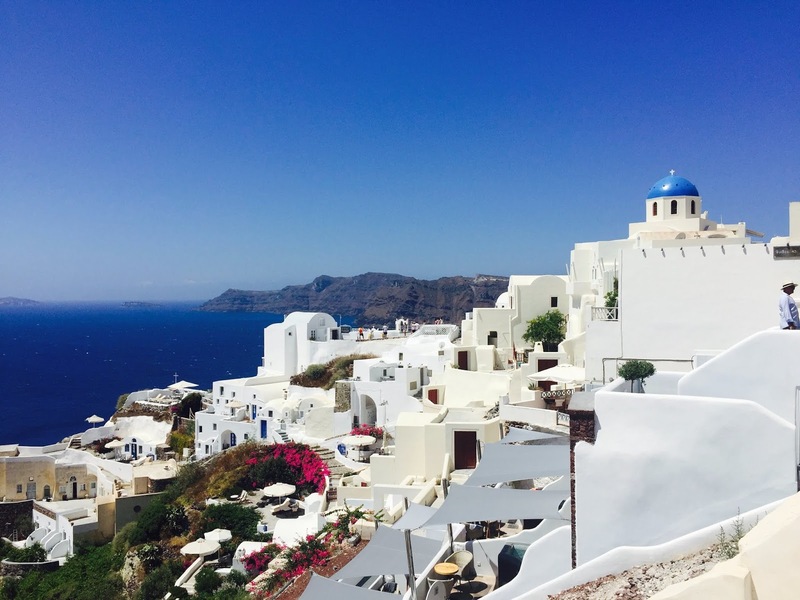 With its bright white buildings and clear blue skies, Santorini is perfect for those who want to clear their head and relax in peaceful surroundings. The slowed-down pace of life means you can do whatever you want, whenever you want. Why not explore the cobbled streets or people-watch outside a café? And don’t forget to watch at least one postcard-worthy sunset. For the ultimate in luxury, jet off to The Maldives. 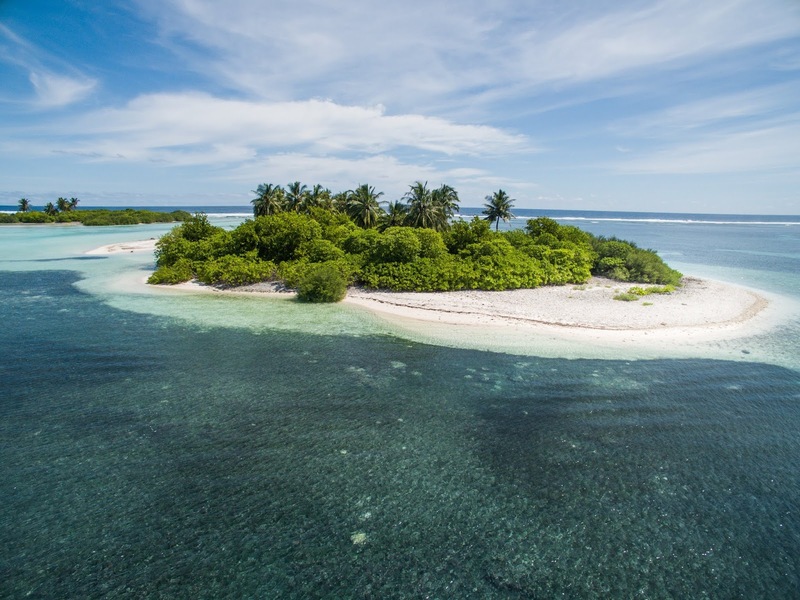 A popular destination for couples, this cluster of islands promises privacy and all the prenatal pampering you could wish for. If you can bear to leave the beach, seek out local restaurants selling freshly-caught fish. There’s a dining experience to suit everyone - whether you want a laidback lunch or something more sophisticated. The National Museum and Utheemu Ganduvaru (a small palace-turned-museum with wooden interiors) are well worth a visit, too. Found in the heel of the boot, the Puglia region of Italy makes for a picturesque holiday destination. 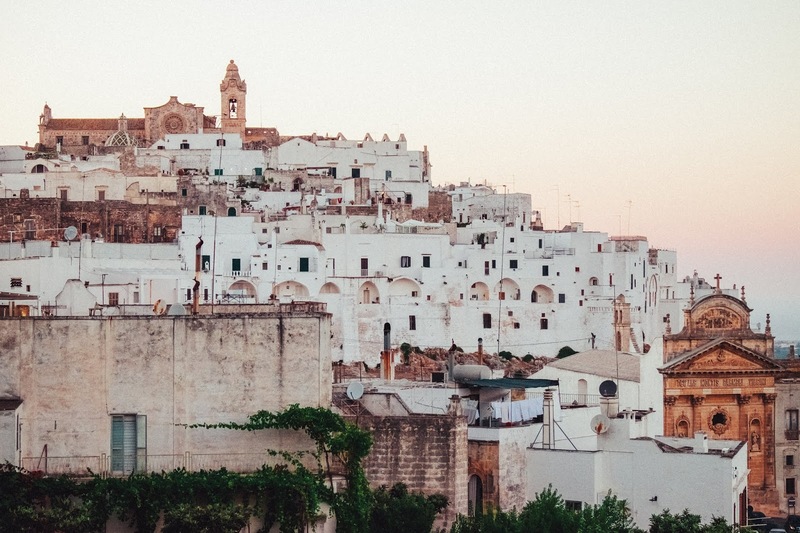 There’s plenty to see and discover, from the White City of Ostuni to the trulli zone (a group of conical houses that UNESCO has awarded World Heritage Site status). However, if you’d prefer to relax then there’s no shortage of spaces to do so. You can take your pick from the beaches, the seaside towns and the hilltops, where you can sit back and admire the stunning views. If you can’t decide between a city break or a countryside getaway, then why not have both? Lausanne is a pedestrian-friendly city with lots of culture and history to explore. 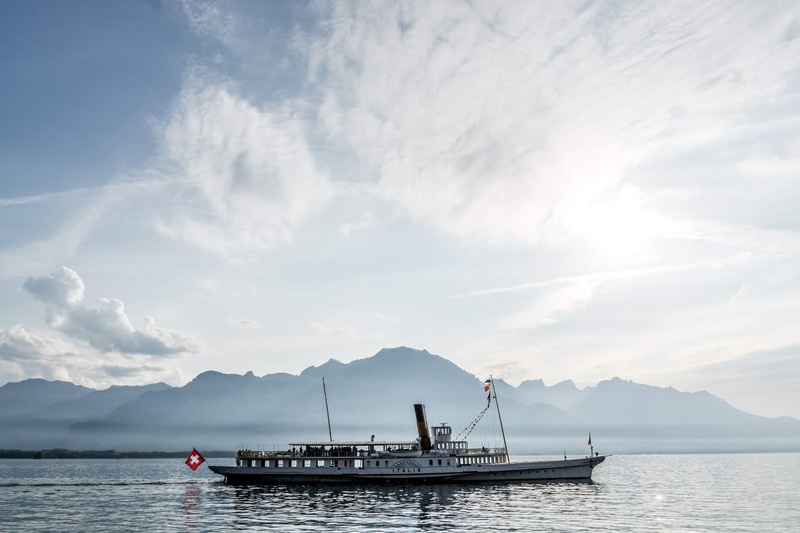 It's leafy surroundings and location by Lake Geneva mean there’s also a lot of greenery and fresh air, which if you're an outdoorsy types, you will love. Browse the markets, sample the food and visit the unique museums dotted around the city, then head to water’s edge for a stroll. An hour and a half away from the hustle and bustle of Los Angeles, the sunny village of Ojai (pronounced Oh-hi) is ideal for chilled out holidays. 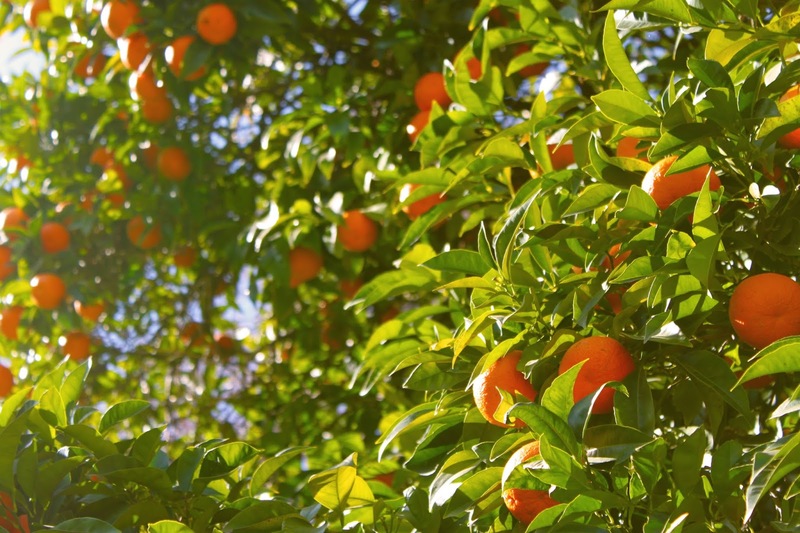 You’ll appreciate the views, with oak trees, orange groves and the Santa Ynez Mountains making for pretty surroundings. While the art galleries and independent clothing boutiques make it easy to while away the hours. For a well-deserved treat, head to Spa Ojai and indulge in their Pampered Pregnancy package, which includes a massage, a facial and a pedicure. Holidaysafe recommend you get waited on hand and foot during this precious time, so why not take advantage? This year Jack and I will be celebrating our third wedding anniversary. It really does feel like only yesterday we were busy planning everything, and getting excited about all the little details! We were on a tight budget - especially as Parker was born just a few months before our big day. 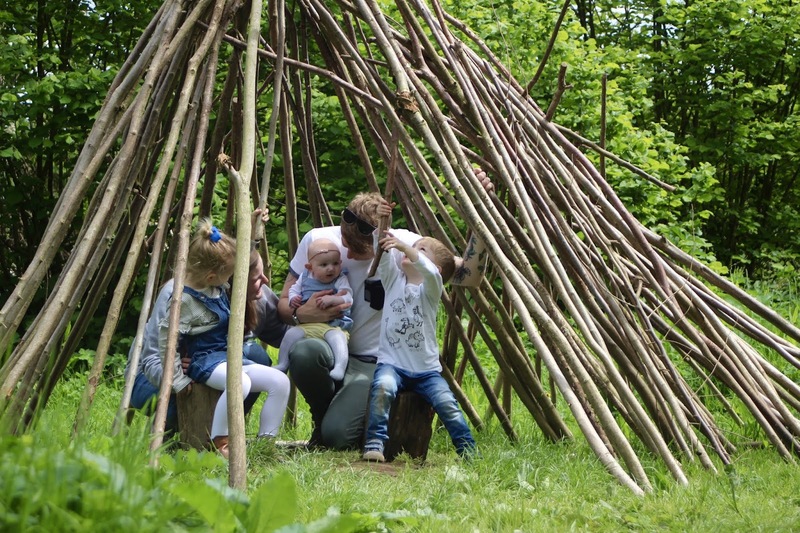 But we quickly found there are so many ways you can save some pennies, while still creating some beautiful memories though. Favours and thank you gifts, although important, are definitely items you can save a little bit of money on. So I thought I'd share a few simple and cheap bridesmaids thank you gift ideas, incase you're also on a budget and looking for some inspiration! 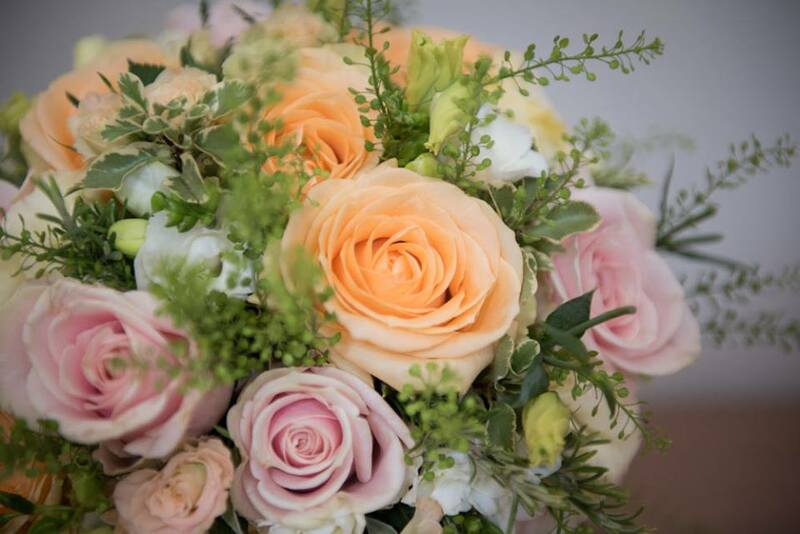 If your bridesmaids are close friends and family, then you cannot go wrong with a sentimental gift. Something they can keep and treasure, as not only a memory of the wedding, but of your friendship. Alex gave her bridesmaids quotes or poems that reminded her of them. She printed and framed them herself too, so it didn't really cost a penny! If you are having a destination wedding, why not give your bridesmaids customised luggage tags like Emma received. It's definitely unique, but inexpensive to create. A bracelet with an engraving, such as the date of the wedding or special message, is a lovely idea. You can find items across all budgets for this type of gift too! Nicole headed to eBay and found little bracelets with a charm on for around £2 each. 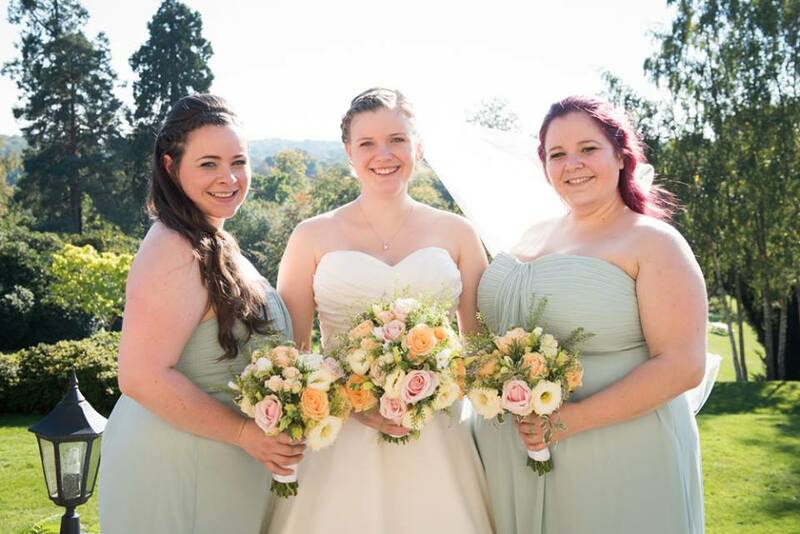 Laura gave earrings in the shape of a bow to her bridesmaids, and said 'the card behind it said "Thank you for helping me to tie the knot"' which is such a lovely touch! Not all gifts need to be sentimental and cutesy, you can definitely go down the more novelty route as well! Why not give a friendship survival kit, with items such as a tissue 'to wipe away tears of laughter when we are together', and a jigsaw piece, as they 'are a very important 'piece' of your life'. I know my bridesmaids would have loved to receive something like this. You can even incorporate parts of your wedding into the gifts, like Julie did for her bridesmaids. She gave them a pair of pink wellies each, as they had photos in a field. So the gift wasn't only practical, but fun and rememberable too! What did you give your bridesmaids as thank you gifts? 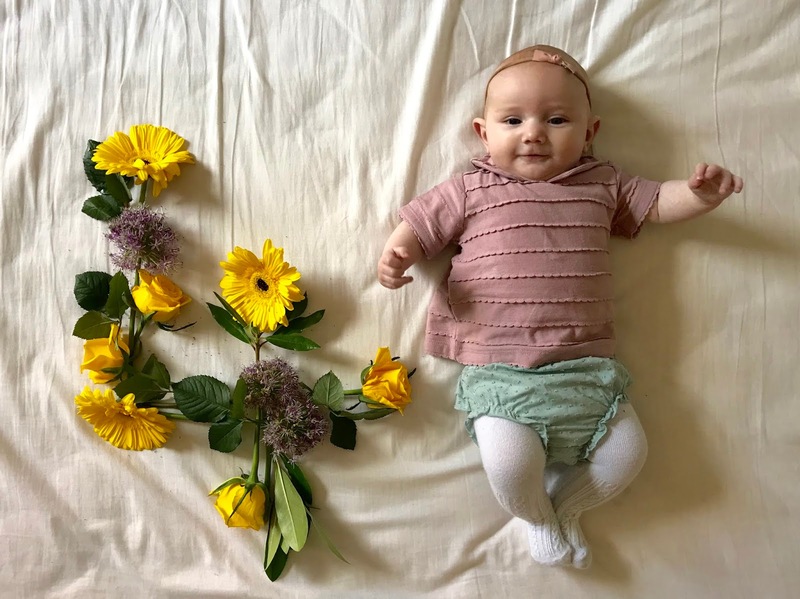 I honestly cannot believe our little Lilah Bear is already four months old. The days may pass slowly, but those weeks really do fly by. And with Lilah being our last baby, I reaaaaally not okay with it! We're now completely out of the fourth trimester, and she is most definitely not a newborn anymore. She's grown and changed so much this month, and it's been so lovely to watch. The milestones are just as sad as they are exciting though. Of course we are the proudest parents when she learns something new. 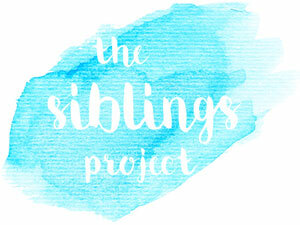 But knowing it's the very last 'first', I just want to cling onto this baby period as much as I can. At 17 weeks Lilah weighed 13lbs 11oz, and she's slowly creeping back up the centiles to the 50th. She's still in a mixture of 0-3 and 3-6 month clothing, although I'm not sure how much longer she'll last in the smaller size pieces. We've moved up to size 3 nappies after countless poop explosions too! As she's a third baby, Lilah really does just slot into our daily routines perfectly. She's now having 8oz of milk every 4ish hours, which makes the days so much easier to plan around. She's still waking around 7am, having bottles at 7am, 11am, 3pm, and then going to bed after her bottle at 7pm. We're still dream feeding her around 10pm, but she can bit hit and miss with this one. 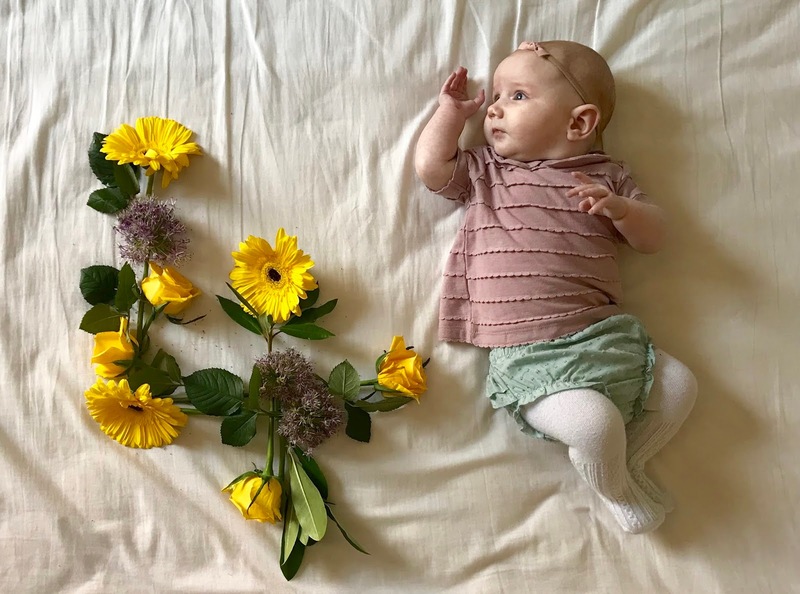 This month has brought the delights of the fourth leap and four month sleep regression. Thankfully sleep at night hasn't been disrupted too much - she does stir quite a few times, but the dummy and Whisbear usually gets her back to sleep. But nap times are bloody awful! She will cat nap for about 20 minutes, and then be wide awake but still exhausted. I'm really hoping we get the long naps back soon, as I think we'd all benefit from them. Lilah has learnt so much already during these developments though. She's definitely found her voice, and squeals and shouts so loudly now. She wakes up the happiest in the mornings, and tells Jack all about her day when he comes home from work. She giggled for the very first time this month too - for her big sister of course! From just being able to roll from belly to back last month, Lilah is really on the move now. She rolled back to front at 16 weeks - a complete shock as I didn't think she was supposed to have mastered this just yet! She's like a little roly poly bug, and will roll within minutes of you putting her down now. And although it's exciting, it's meaning she's being sicky more and my goodness are nappy changes harder too. She's constantly wanting to be upright now too; trying to sit herself up whenever she's on her back. Where did my baby go?! She's grabbing and reaching for toys now, and absolutely everything ends up in her mouth. I'm still unsure if teething has begun, but she is pretty dribbly so I don't think it's far off. Her favourite thing to chomp on is your fingers - I think we need to invest in some good teethers asap! Lilah is now 4 months old, and I feel like life is starting to become a bit more normal again. Well, as normal as it can be with three little ones aged 4 and under! But with the summer fast approaching, I've been thinking that it might just be time to start thinking about shedding those last few pounds of extra baby weight. Especially as we have two weddings to attend in a few months! Before having children I was at my slimmest; something I was oh so lucky to return to after having my first baby. Two more babies later (I've had all three in under 5 years) my body has just given up on me though, and the weight doesn't seem to want to shift. 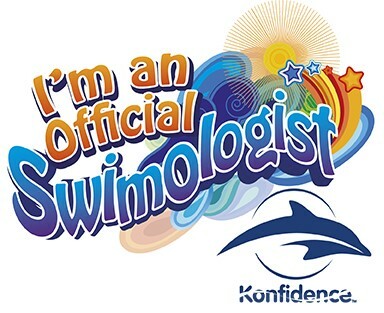 I'm hoping with determination and a lot of hard work I can change this though! The first step I definitely need to tackle is my diet. I am a very guilty snacker - especially in the evenings once the littles are in bed. I can eat as healthy as I want during the day, but then ruin it by eating a whole packet of biscuits in front of the telly... oops! Quite a few members of my family have recently started Slimming World, so I think I may look into it too. Having the group support would be great, and as it's more about portion control and healthier choices, it shouldn't make meal times with the littles any different either. I'm not sure I could cut out the yummy treats completely - we all need them after a particularly bad parenting day right? But I definitely need to find some healthier options! Another easy change I want to make is to get out walking more. I don't drive so I do generally walk most places anyway. But I've got into a really bad habit of jumping on the bus, or just not going somewhere if I have to walk too far. It's such an easy way to get exercise into the day though, and it usually results in a buggy nap too! Once Indie starts school in September, and Parker is having full days at preschool, I want to make it a habit to get out on long walks with Lilah in the pram for definite. I know making these changes are going to be tricky at first. Especially as I've just got stuck into terrible habits since having the littles. 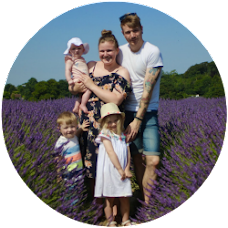 I have looked into maybe signing up to an online personal training plan, in order to have a proper structure and support throughout my journey. I just want to get back to feeling confident and happy with my body. Especially now it's completely mine and not a home to anymore babies! 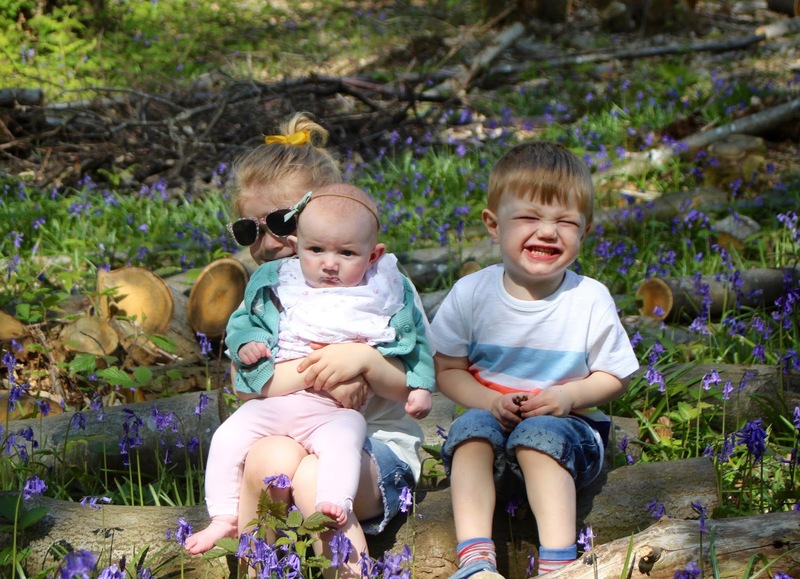 Of course for this month's siblings project photos we had to hunt down some bluebells. I think it's going to become one of our new yearly traditions! 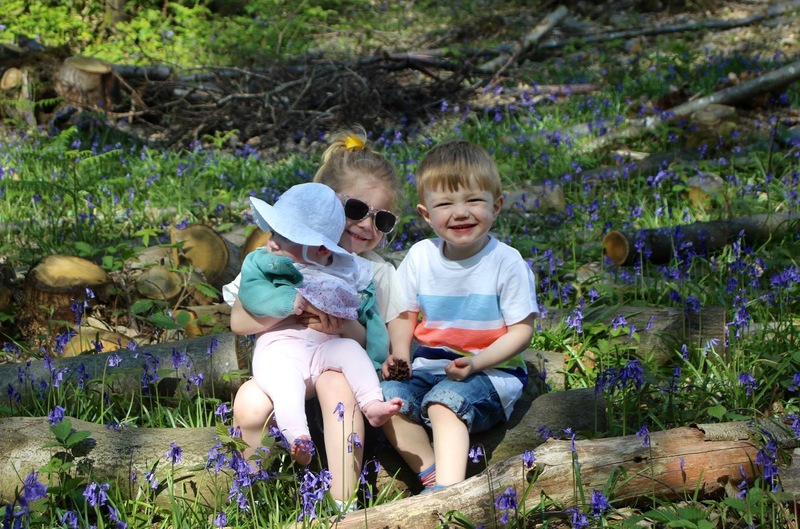 The trip wasn't quite what we expected though - lots of mud, red ant attacks and almost not finding any bluebells at all... but it was definitely worth it for these lovely memories. May has been an oh so lovely month so far. Helped of course by the return of the glorious weather and long bank holiday weekends. Getting out and about definitely makes all the difference with Indie and Parker. Does anyone else find that? At home they bicker and argue over the littlest things. They can't even sit next to each other for longer than 5 minutes without someone annoying the other! But it's as if the fresh air has something magic in it when we're out - they play soo nicely and want to be in each others company. Their new favourite game is to play Dora the Explorer (Indie's Dora and Parker is Boots apparently), and run along holding hands. I just wish they could play this way at home too! Lilah is now 4 months old, and becoming more interactive as each day passes. The older two are still absolutely obsessed with her, and honestly I think the feeling is finally becoming mutual! She gives them her biggest smiles, and her very first giggle was because Indie was making her laugh. When Indie has been at preschool all day, the first she asks for (even before a snack) is if she can give Lilah a cuddle. And they both rush to her bedside in the mornings to give her squishes and kisses. 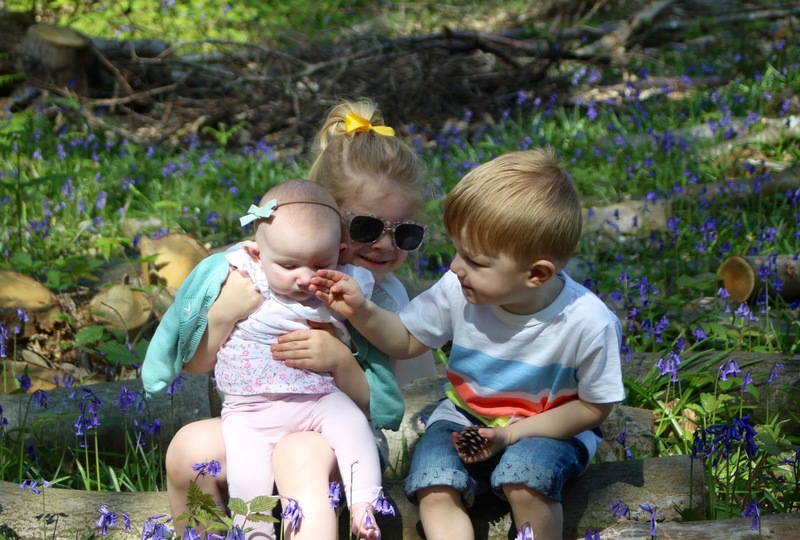 It's so lovely to know how much they adore their baby sister. I was worried a third would have an affect on the bond Indie and Parker have, but I really had nothing to worry about. They absolutely adore her! As a nation, we Brits really do love our gadgets and we do strive very hard to protect them. There is a booming market in phone and tablet cases, screen protectors and even solutions that can make our gadgets waterproof. Despite all of this effort to protect our devices however, it seems that accidents are still happening, and that they are costing us a lot of money. A survey reported on by PCR magazine in 2016, revealed that Brits had spent a whopping £3 billion on replacing gadgets over a 5 year period. With the cost of our gadgets increasing each year, as better technology is invented, now is probably the best time to consider insurance products for these gadgets. It’s easy to think when we buy a new phone or tablet, that we are going to love it so much that we will take extra special care of it. We'll buy a phone case and a screen protecter, and then think we don't need to spend any more money on insurance. After all, we’re adults, we can look after a phone without dropping it, or keep it away from water. Can't we? A survey from Switched on Insurance however, has revealed that this is not always this case. It seems that however hard we try to look after our gadgets, there are times when you just cannot prevent the situation. I know I am guilty of passing my phone to the little ones when out and about, and there have been many occasions where I've left it on the side, only to find them playing with it 5 minutes later! Apparently I'm not alone though, as the survey revealed that 28% of parents report doing this (and then regretting it as their child has dropped and damaged their device). Would the possibility of breaking my phone stop me from passing it over in a moment of need though? Probably not! Another 20% of Brits even reported that their dog had chewed their device - is there really any way they could have prevented this? I know a lot of people - myself included - take their devices with them to the bathroom too (there's nothing better than a bubble bath and Netflix). There's just no way of knowing that your phone might end up down the loo, or dropped in the bath is there? Maybe we should bare this survey in mind the next time we are offered insurance for our gadgets. I know that I would much rather pay a smaller amount each month or upfront with my purchase, then have to fork out a large amount when the inevitable happens and my device is damaged. If this article has convinced you, you can research more about gadget insurance on money.co.uk. 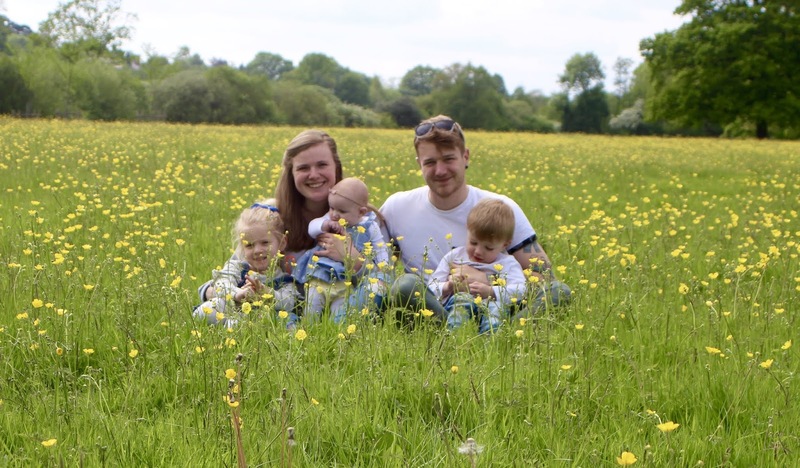 From the moment we arrived home from hospital with our little Lilah, we've used our Sleepyhead Deluxe+ Pod. She's now been sleeping snuggly by our side in it for over three months, and I must say it's quickly become one of my favourite baby items. And one I would recommend to parents new or old a million times over! The Sleepyhead Deluxe is the original baby pod. Designed and produced by Swedish company Enfant Terrible, it has been thoroughly tested to ensure it's safety. 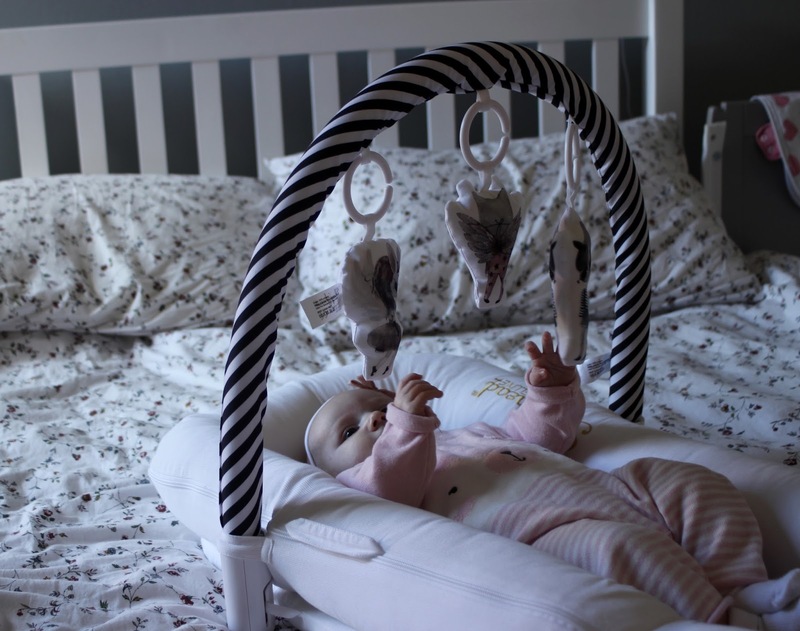 The pods comply with the British standard on air-permeability (a test designed to replicate a baby placing its mouth on an item and breathing through it), so is therefore safe for supervised overnight sleeping. Lilah has slept in her Sleepyhead every night since she was born, and I like to think it's one of the reasons for how well she sleeps at night. When she was a newborn we had the clip at the bottom closed to create an even snugglier 'womb like' environment. However now she is 3 months, and stretched out a lot more, we have unclipped this to give her a little more room. The Sleepyhead Deluxe is suitable for up to 8 months (approximately 22lbs) though, so there's still plenty of growing room left. As well as overnight sleeping, the Sleepyhead Pod has multiple other uses. Day time naps, supervised tummy time, playtime or even just a safe and comfortable spot to place baby during the day. With two older children at home, we've found the Sleepyhead to be a perfect safe space to place Lilah. The Pod creates a perfect barrier between her and everyone else in our bed - plus it's lovely and comfortable for her too! 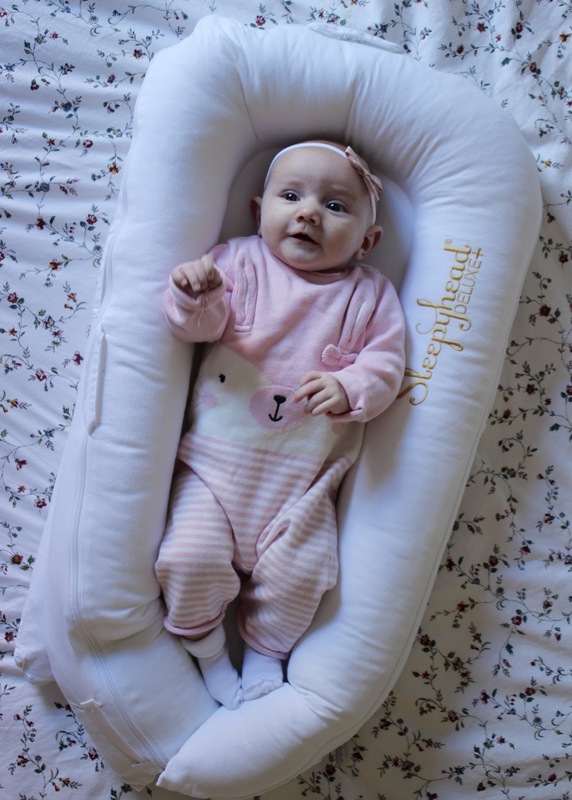 The Sleepyhead Deluxe is hypoallergenic, so there's no need to worry about the materials against your newborns delicate skin. The cover is fully removable and washable too, which is an absolute must with a baby! We've washed ours a number of times now, and although the cover is rather tricky to get back on (although very easy to get off thanks to it's zips), it's definitely worth it. You can purchase spare covers, but as these are quite pricey we've chosen not too. The updated Deluxe+ version of the Sleepyhead, has been designed to be compatible with the Mobile Toy Arch and toys (both sold separately). So although we mainly use the pod for overnight sleeping, it's lovely that we can use it for playtime too. 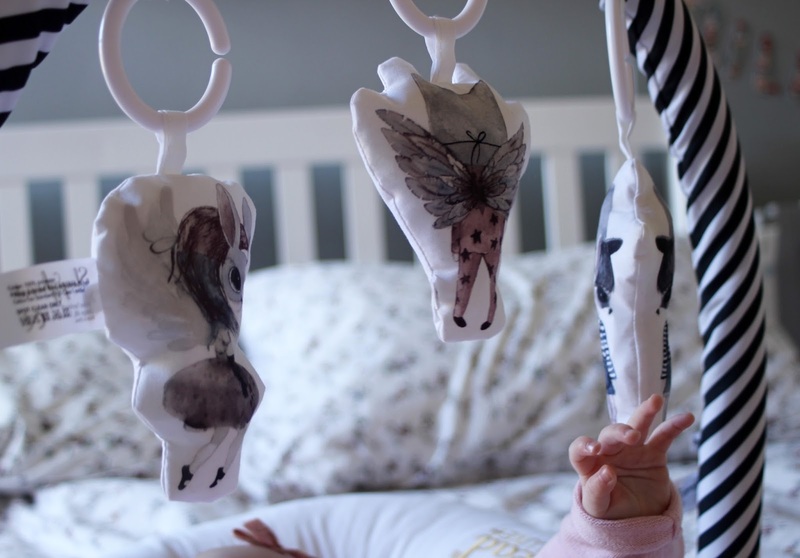 The toys are crinkly and engaging, and the black and white on the arch is perfect for babies. Lilah has just started reaching and grabbing for toys, so this is a perfect addition for her now. 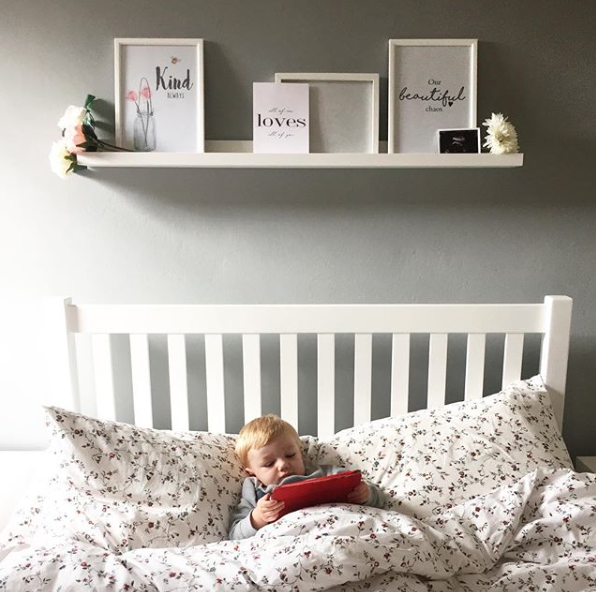 Overall we absolutely love our Sleepyhead Deluxe Pod. Lilah has slept well in it from the very beginning, and I love putting her to bed knowing she is comfortable and snug. We love the pod so much we even packed it in our suitcase on our recent holiday to Disneyland Paris! The pod is light so it was easy to transport, plus it was much more comfortable for her to sleep in than a hard travel cot. 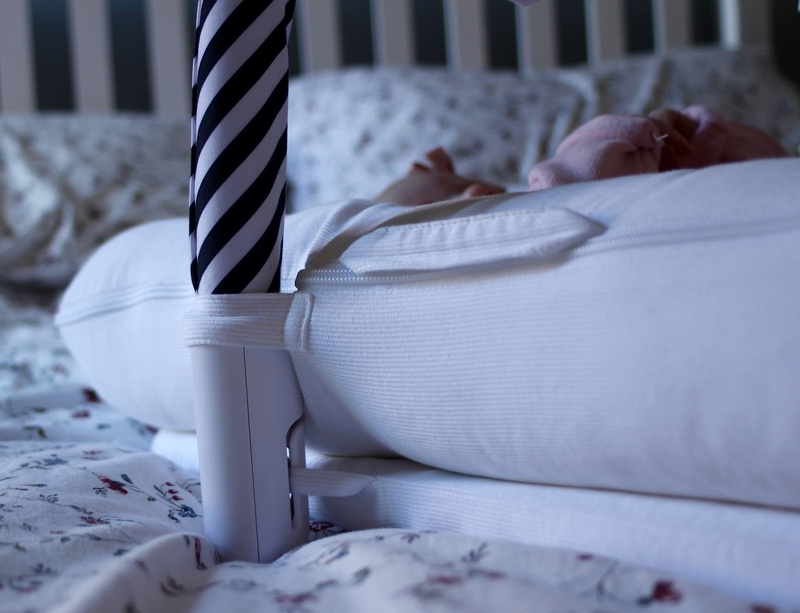 The Sleepyhead Deluxe+ Pod is available to buy from a number or retailers including John Lewis, Mothercare and Amazon. It retails at around £130, which I do believe it quite high - however it's definitely worth it for a good nights sleep for you and your baby! We received this item in exchange for our review. All opinions are honest and my own. 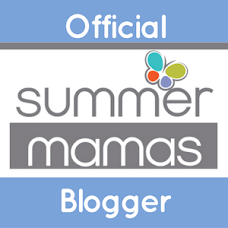 This post contains an affiliate link which means if you buy the product when using my link, I’ll receive a few pence in return.